Windows tablets are not often found in the Bangladeshi market. 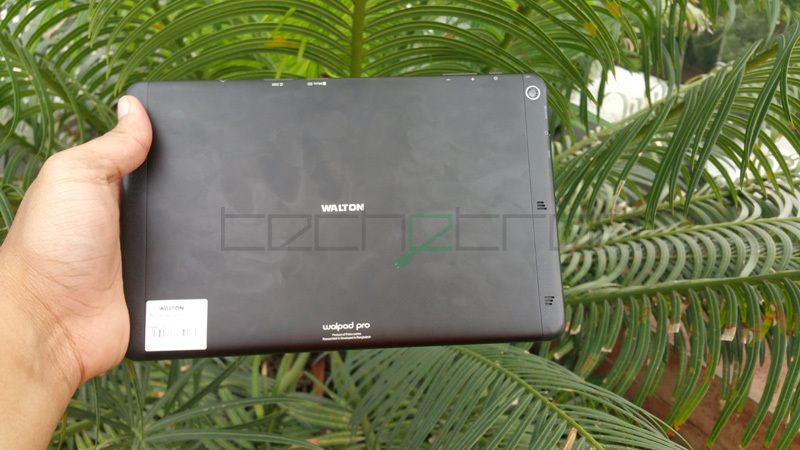 Walton has hence taken the initiative to bring a Windows 8.1 powered tablet to its consumers, the Walton Walpad Pro. Question is how good is it? The Walpad Pro is built very similarly to the Walpad 10X. The device has a non-removable metal back along with plastic edges at the sides for the antenna. The plastic also has a faux leather finish like the Walpad 10X. The sides of the device are nicely curved to feel comfortable when in hand. 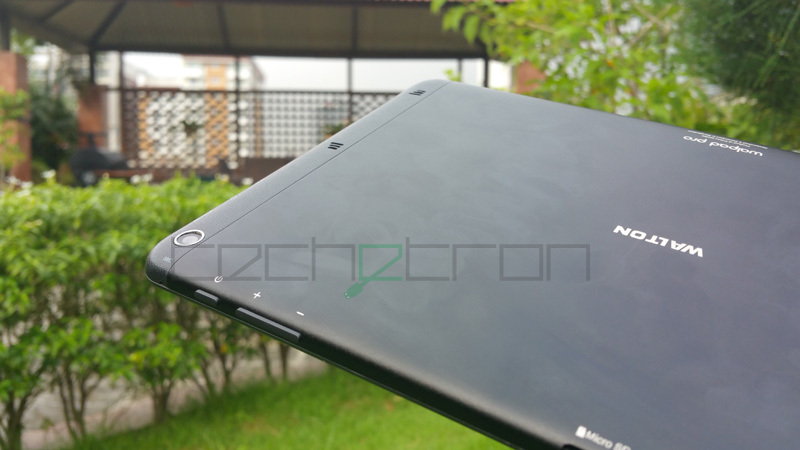 At 8.5mm thin and weighing 460 grams, the device is quite easy to handle too. The bezels around the display are sizable and offer enough space to rest your thumbs when held in either landscape or portrait mode. The power and volume buttons are responsive and clicky like the Walpad 10X. As this is a Windows 8.1 tablet, we have many options and ports for connectivity. 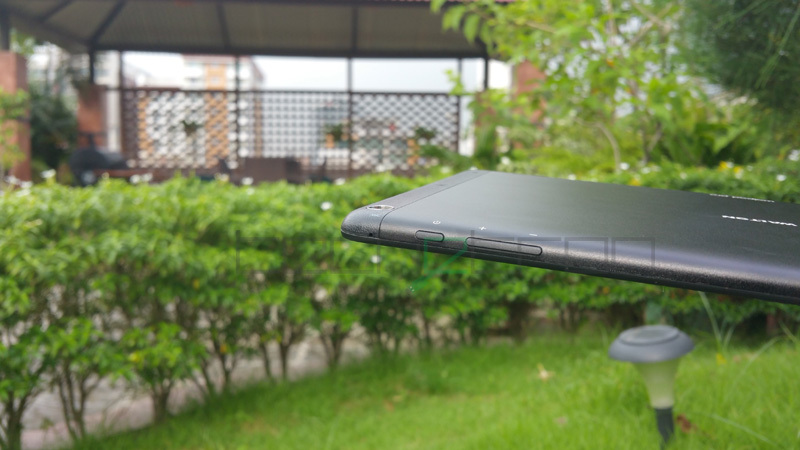 Along with the usual microUSB and headphone jack, the Walpad Pro is equipped with a SIM card slot (3G supported), microSD card slot and a micro HDMI port. The dual speakers are rear facing and are located on the same plastic strip on the back as the camera. The speakers perform quite well and offer a pleasant experience so long as you make sure not to cover them up. The Walpad Pro supports USB OTG hence Walton has included an OTG cable in the box. Other than that, they provide decent quality headphones with flat cables to prevent them from getting tangled. There is also a very large screen protector as usual for when you need to replace the one that comes preinstalled. The display on the Walpad Pro surpassed my expectations. With a resolution of 1920 X 1200 pixels, the 8.9 inch IPS display has a resolution of approximately 255 pixels per inch which for reference is almost the same as the pixel density of the new iPad Air 2 (264ppi). Images and videos look very nice on the wide canvas and make media consumption enjoyable. The display is also protected by Corning’s Gorilla Glass. Viewing angles on the device are nice and the brightness was quite flexible. The display was easily viewable outdoors when the brightness was near maximum and was also comfortable to use at its lowest setting in the dark. We will not go in depth into the software as Windows 8.1 is virtually identical across all tablets. Having said that, the Walpad Pro flies through the OS without hesitation. Transitions are smooth and stutters are quite rare in regular use (more on that in the performance section). 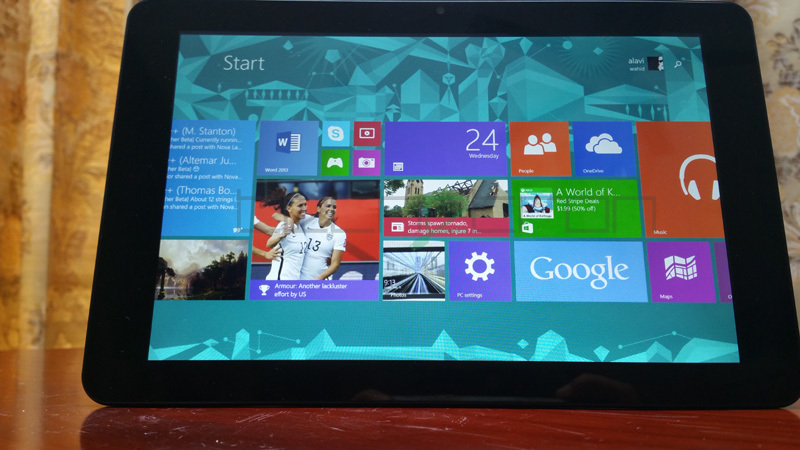 The most notable aspect of the software on the Walpad Pro is that it is genuine Windows 8.1. This gives lots of benefits to the user. Windows 8.1 alone costs $119 which helps explain the price of the Walpad Pro. Timely software updates will help patch up bugs as well as improve security. What is most important in my opinion is that the device will be eligible for the free Windows 10 upgrade coming this July! The Windows 10 previews already look awesome and incorporate a lot of changes that makes the OS friendlier for touch. Please note that to get Windows 10 for free, you must upgrade within ONE Year of its launch. Walton rounds up the software package by throwing in a one year subscription of Office 365(which costs $69.99) and 1 Terabyte of One Drive storage (that costs $6.99) completely free of charge. The Walpad Pro packs a quad-core 1.33 GHz Intel Atom Processor with 2GB of DDR3 RAM, Intel HD Graphics and 64GB (53GB user available, expandable up to 128GB via microSD) of built in storage and a 6000mAh lithium polymer battery. When it comes to simple day to day tasks such as web browsing and word processing, the device performs without any hiccups. When gaming, the Walpad Pro handled things very nicely and ran smoothly without noticeable lag. Battery life on the device depends on what brightness setting is in use. In my tests, I have managed to get about 5 hours of battery with the brightness set to approximately 70%. When the brightness was kept to a minimum and no games were being played, I managed to squeeze out almost 7 hours of battery life which is expected on a Windows 8.1 tablet. The camera of the tablet is its weak spot. For tablets, the 5 megapixel CMOS main camera is actually quite a decent specification and captures photos of usable quality. The front facing 2 megapixel camera is quite good for video conferencing. With the main camera, we see some common issues associated with a lower megapixel count such as visible graininess. Colours often times are washed out and low light results are not pleasing. Outdoors under good lighting, the camera yields much better results. The Walpad Pro is a very capable tablet. As it runs Windows 8.1, it is essentially a portable touch based computer. The device has high build quality as well as a smooth and powerful OS. With Windows 8.1, the main benefits lie in the ability to use the tablet as a hub for productivity on the go. If you are looking to edit Word documents, Excel sheets or Powerpoint presentations while on the move, this is a very good option. A benefit for gamers lies in the fact that you can download and install both PC games as well as games from the Windows app store on the device. The inclusion of an OTG cable encourages consumers to use PC peripherals such as pen drives and external hard drives thus expanding the user’s capabilities. The micro HDMI port also allows the devices screen to be cast easily onto compatible monitors with the necessary cable. All in all, at Tk/- 19,990 the Walpad Pro is a great offer if you are looking for a Windows powered tablet. The market really does not have many products that are at this price point and offer such specifications. This coupled with the genuine Windows stamp and future upgrade to Windows 10 makes the Walpad Pro much more exciting than it may appear.